Many members from around the world send their thanks to WAIMH and the Local Organizing Committee for planning and hosting an extraordinary WAIMH Conference. From the reflections received below, it was personally and professionally a very successful and meaningful experience for research faculty, policy makers, and practitioners from many corners of the globe. We send our deepest and collective appreciation for an exceptional world conference and Roman holiday! I would like to express my appreciation to the Italian Association for Infant Mental Health (AISMI) organizing committee and the WAIMH staff and Program Committee for putting together an intellectually stimulating and productive 16th World Congress in Rome. 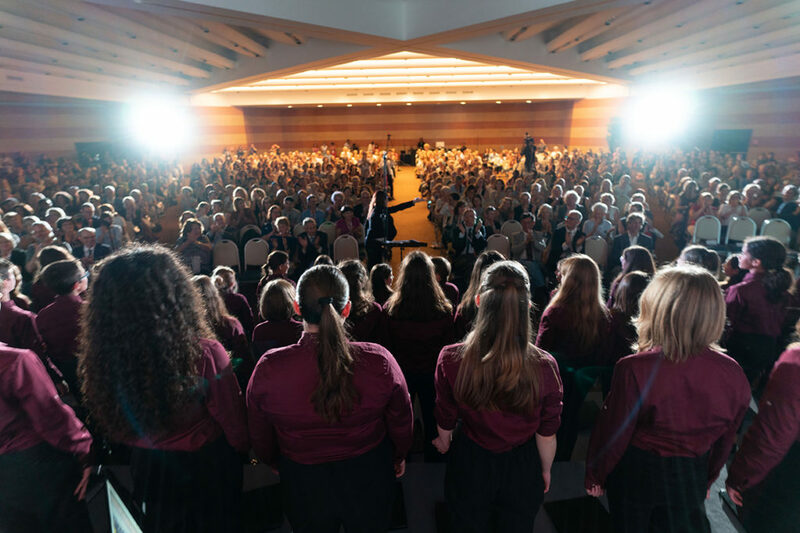 AISMI gave a warm welcome to 1750 delegates from 72 countries who delighted in hearing the children from Schola Cantorum sing in the opening ceremony. Their final gospel song in English got such a rousing response, they repeated it for an encore! With such a large number of presentations, plenaries, master classes, posters, and meetings, it was difficult to choose what to attend, and I often wished I could have fit more in my schedule. I enjoyed learning so much in the sessions I attended on prenatal development, digital media, epigenetics, internal representations, therapeutic interventions, public policy, and parent-child relationships. I enjoyed presenting with my colleagues, Alicia Lieberman and Sheree Toth, on Child-Parent Psychotherapy. But the most encouraging part of the Congress was joining together with so many people from around the world who persevere in difficult circumstances to shed light on the challenges faced by young children and their families and who will not stop until we have supported these vulnerable world citizens and promoted a more positive world in which they can grow and develop. Erum Mariam brought me to tears as she shared her experiences in the refugee camps in Bangladesh. I continue to be awed and inspired as I hear of the outstanding work that is being done around the world to combat tragedy and promote healing. Joining together and building our own relationships gives me hope that together we can make a difference and truly make the world a better place! As the Congress drew to a close, the Australian Association for Infant Mental Health took the torch and invited everyone to the 2020 Congress in Brisbane. I am looking forward to reuniting with an amazing group of international colleagues in two years. WAIMH was an energizing experience, connecting with friends met at previous Congresses, meeting new colleagues, and hearing messages from those committed to making the world safer and more emotionally safe for infants and young children. Congratulations and thank you to all who made the 2018 Congress such a meaningful event. It was an honor and a privilege to attend the 16th World Congress for Infant Mental Health in Rome. The opportunity to listen and witness the research, clinical interventions and cross-cultural studies that held varying perspectives of caregiving practices and socio- emotional health was an amazing gift. To hear our Infant Mental Health Leaders and Mentors talk about the impact of trauma and separation on families and young children, both nationally and internationally, was powerful and reignited my passion and commitment to our most vulnerable citizens. The conference was a reminder that we cannot do this work alone and that we are not alone. There are 100’s of thousands of voices speaking out on behalf of infants and young children. I was proud to be one of the many voices in Rome along with many of my Michigan colleagues who were well represented at the conference. Thank you for this incredible opportunity to learn and grow. The 16th WAIMH World Congress was held in Rome at the end of May 2018. True to Roman tradition, it was a big event – possibly the biggest WAIMH Congress with participants from many countries having found their way to the Eternal City. The choice of papers was wide and large – for some it was overwhelming, for others it felt like a rich menu from which to choose. WAIMH faces a challenge in that a balance needs to be found between offering an international platform to colleagues from all over the world, while preserving the ‘soul’ of WAIMH. What is this ‘soul’? It has to do with getting to know people, with a lively exchange, with time for discussing ideas and for sharing experiences. This is somewhat impeded by too large a gathering and with too many happenings. At the same time, this largeness also attests to the enthusiasm that is evident from all corners of the globe – the enthusiasm for speaking up for those too young to have the words to do so. Of particular relevance was the Presidential Symposium held on the last day of the Conference. The focus on the worldwide refugee crisis and its effect on infant mental health was of critical importance given the catastrophes that are facing families in the world today. Erum Mariam spoke with urgency of the refugee camp in which she is working in Bangladesh, leaving us with images and stories of unimaginable suffering. It was a call to action – action for infants and young children – that we as WAIMH dare not ignore. On a lighter note, there was true Italian passion in the air at the gala dinner when the four sopranos transported us with their elegance and beautiful voices to the world of the Opera. Rome is big and very old, fascinating in its ordered chaos. It was with sadness that we said goodbye to this City. WAIMH is such a unique experience due to the wide range of ideas that are shared from research, clinical, and advocacy viewpoints and from just about every cultural experience. But what I would like to highlight about my experience are the lovely chance conversations that I had with people from all around the world. An example that stands out: I was at the poster session and started chatting with a presenter. We had a productive dialogue about her research and then we discovered some similarities in our experiences with our administrators, grandmothers and gardeners! What a hopeful moment for me, coming from a context in the States that is much too often about “us and them” at this point in history. It felt great to have these points of alignment not just about our shared work, but also about our shared experiences as human beings. What an amazing Congress we have just experienced! Immeasurable thanks go to Giampaolo Nicolais, Massimo Ammantini and the Italian Local Organising Committee for providing such a creative fabric within which the rich content of the scientific program was delivered by colleagues from all over the world and thanks also to the Scientific Program Committee and the overall Congress organizers. For me the Congress provided an opportunity to learn so much about very vulnerable infants and their families and about the plethora of ways that our colleagues in infant mental health are able to assess and so thoughtfully intervene. It began with the pre-Congress sessions which focused on innovative research and applications and with the importance of training supported by our Affiliate organisation colleagues. Each of the plenary sessions took us in different directions, but all building a deeper understanding of the modern world of babies and their families. In each of the oral and poster presentations which I observed I saw a generous sharing of ideas and their clinical application. I feel very proud to be a member of the WAIMH community. The Presidential plenary session, however, reinforced for me the importance of advocating powerfully for infants in families who are persecuted and displaced. Although there is so much inhumanity in the world which is difficult to comprehend, I believe that a powerful spirit of working together to a common goal was demonstrated moment to moment amongst the 1700 participants in the Congress! I really look forward to applying what I’ve learned at this Roman Congress and to meeting again at the next Congress in Brisbane 2020. A month after the event, I find myself still in awe of the experience of attending the WAIMH Congress in Rome. The future of the field of infant mental health felt limitless as I sat in the plenary room with 1,750 other individuals. I could feel, hear, and see the energy, passion and dedication we had in common. Thank-you to the WAIMH staff and Congress planning committee for providing us the space to be inspired! Coming to WAIMH and having the opportunity to hear about the work being done around the world on behalf of infants and toddlers was so inspiring. In a time when things often feel hopeless or overwhelming, it was an incredible reminder that we are not alone. There is a brave army of professionals out there with so much compassion, love and positive energy fighting on behalf of all babies, toddlers and their families. A strong group of people who all understand the power of relationships, ready to change the world. The whole experience was refueling so that I could come back and continue the most important work there is. The 16th WAIMH World Congress in Rome was a wonderful Congress. I am thankful to the Italian Association for Infant Mental Health (AISMI), to Giampaolo Nicolais, Massimo Ammantini and everybody on the Italian Local Organising Committee; to the Scientific Program Committee; our WAIMH staff; and the Professional Conference Organisers, for their generosity and work. Collectively they co-created an extraordinary base from which delegates could continue to explore and learn about our shared, complex, and interdisciplinary field. Amidst the daily feast of plenaries, posters, workshops, symposiums and master classes, there were numerous memorable moments of marvelousness: from the delightful children’s choir from the Schola Cantorum, in the opening ceremony; to the amazing opera divas during the conference dinner; to listening to fresh energetic new graduates; to sharing time and experiences with WAIMH affiliate council members; and being moved and heartened by the narratives of colleagues who are working with families with infants in day-in and day-out extraordinary challenging conditions and yet, amidst the despair, beckoned us to keep hope on our radar. Hope rooted in deep connection with those who suffer has the capacity to create momentum with healing and change, keeping paralysis and helplessness at bay. Experiences of face-to-face time with old friends and new friends are now embedded as nourishing memories; as new fuel to sustain our ongoing work together, across the globe. At the end of the congress, the Australian Association for Infant Mental Health invited us all to the 2020 Congress in Brisbane. I very much look forward to meeting many of you again at the next WAIMH Congress in Brisbane 2020.